Genres: Historical, Romance, Fantasy, Martial Arts, Mature. 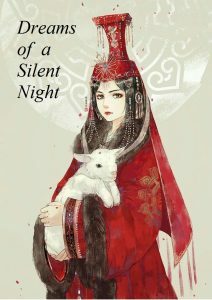 Dreams of a Silent Night is an ongoing novel written by Neha. Shui was a high class courtesan in ‘Spring Flower Pavilion’,the famous brothel, where her job is to entertain the guests. He was a mysterious man who she happened to save by chance. It was a chance encounter and they never expected to meet each other again. But,by weaving their destinies together and by making them meet again and again, Fate sure works in it’s own mysterious ways. ‘Once broken, though fixed, it will never be the same.’ she stated coldly. ‘ Yes, it may never be the same. But, if fixed, it will much more beautiful than before.’ he replied with a warm smile. In a world filled with men who broke her, she willingly bowed her head to the man who respected and loved her. As time passes, secrets resurface and the past threatens to destroy the current peace in Shui’s life. Is their love strong enough to last through all the trials and tribulations? I do sponsored chapters at 5$ each. @Niha – this name sound so familia to me. I hope you are the same author I think you might be.